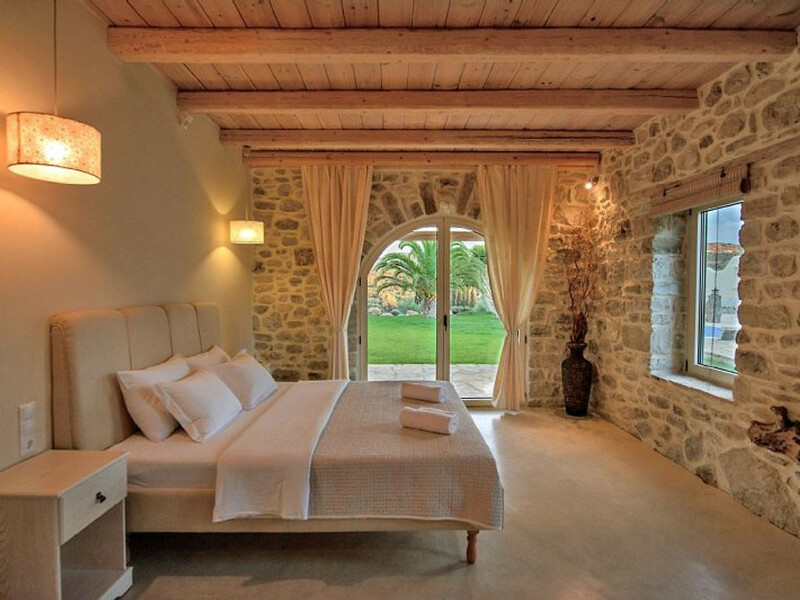 Large and spacious, Villa Armonia offers our guests peace and privacy. 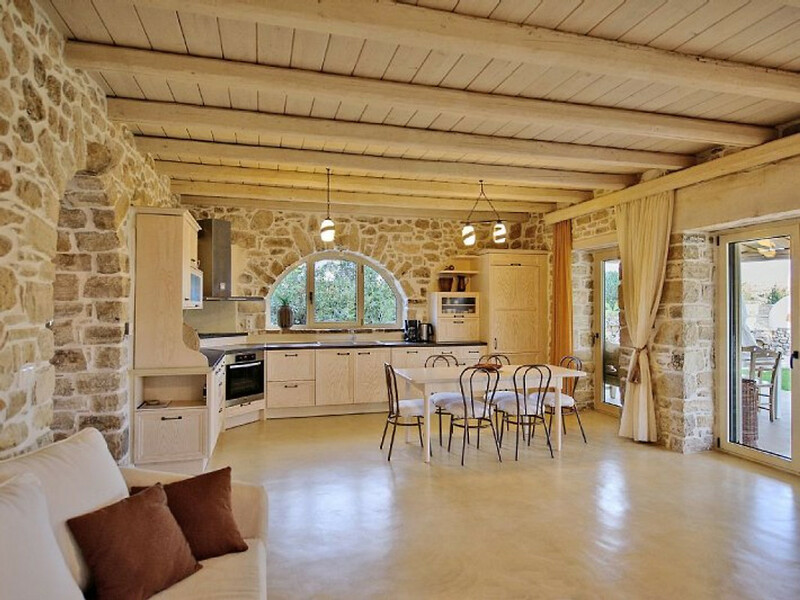 Villa Armonia is really generous deals, high, wide spaces, it has natural light through the large windows that create a very friendly atmosphere to make guests feel at home. 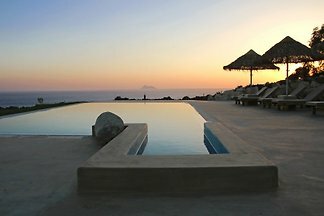 The dimensions of the private pool are 8mx5m. It can be heated during the cooler months by electricity (surcharge upon request the cost is 30euro per day) - the pool is heated, so that water can reach at 28 Celsius degrees. Special feature of the pool is that it has no chlorine, as it has salt water and is equipped with salt filtration system. It is surrounded by a picturesque lounge area that is protected on two sides by an artistically designed wall. Outdoor shower, toilets by the pool (with hot and gold switches) and deck chairs also stand by the pool. There is also a well equipped kitchen and an open plan living area with fireplace, sofa beds and doors opening onto a dining and lounge terrace. 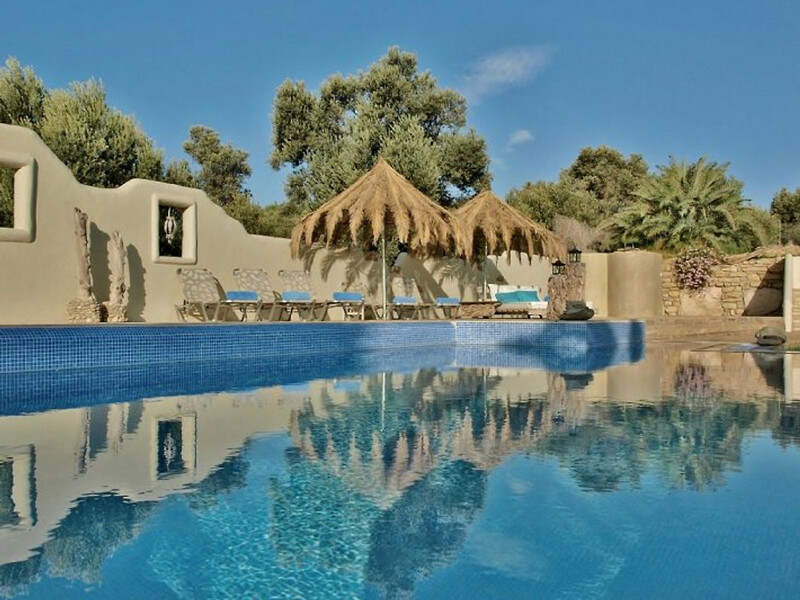 As for the bedrooms they are all fully equipped, air conditioning with private terrace with access to the garden and are a large room with a double bed ( m) and a single bed, a room with two single beds. Both bedrooms are equipped with TV and share a bathroom with shower. An interior staircase leads up to the impressive 100m2 bedroom ( bed) with a native cypress tree trunk emerging through the floor to the high ceiling. The bathroom is open-plan and has a jacuzzi bath in the middle. Glass sliding doors open onto a private sun terrace with stairs leading down to the pool and garden. 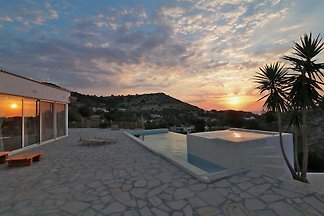 The villa has underfloor heating - floor cooling system and it is air conditioned. 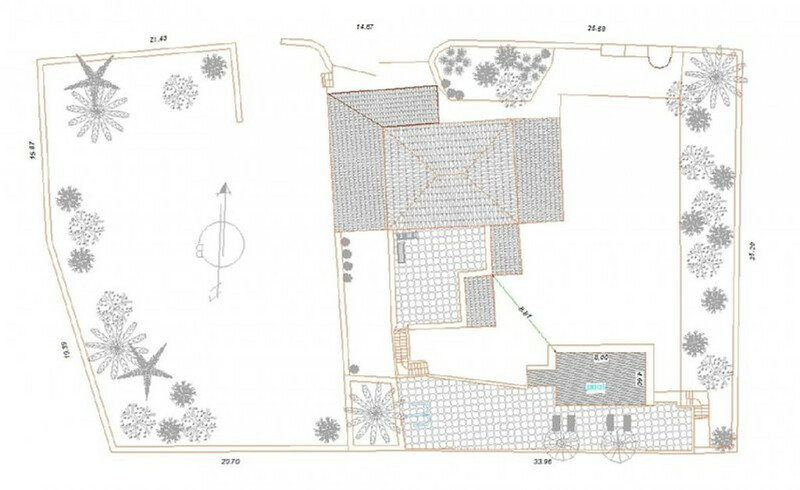 In addition, a dive in parking for 2 cars is located next to the house, with a tile pergola. The price includes (the house, the pool, the electricity, the taxes, water, air conditioning, pool heating). 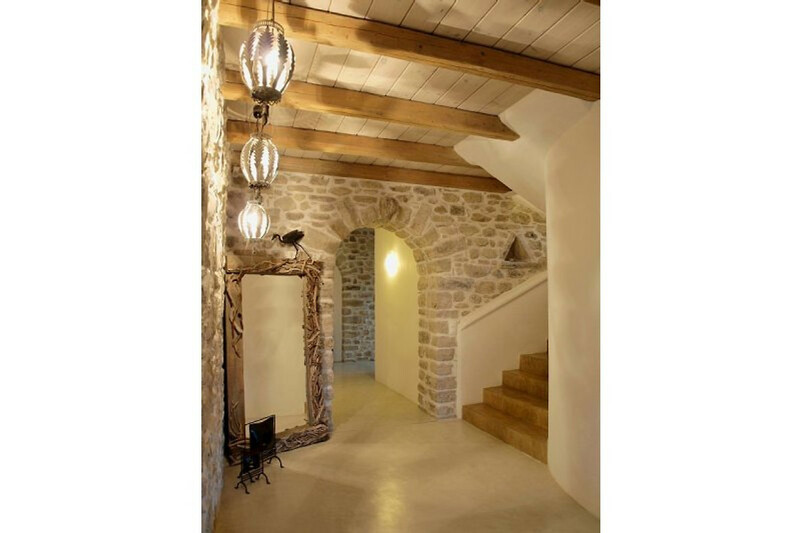 Villa is decorated with simplicity, warmth, wood, stone and stylish furnishings, coupled with creativity and craftsmanship, the main elements of this beautiful holiday home are in one of the most beautiful areas of the island, the Messara -Valley. 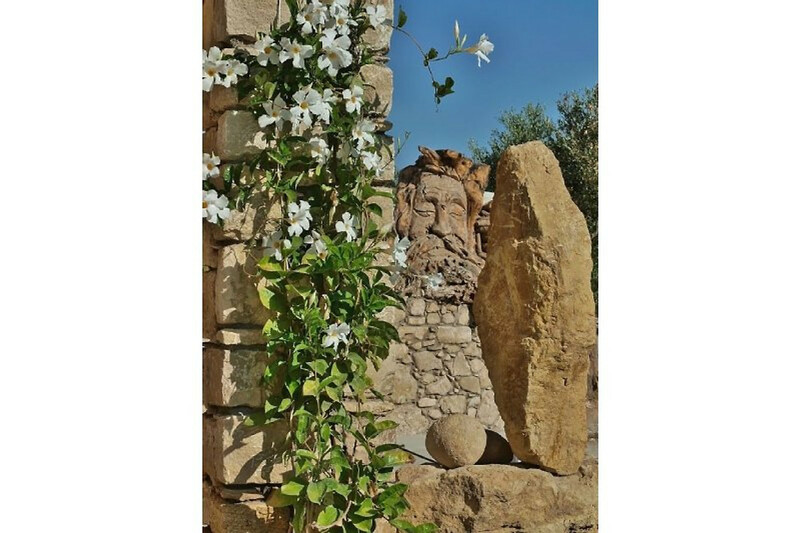 We are pleased to hear from our guests time and time again that the area of ​​Phaistos is considered as the most beautiful part of Crete. 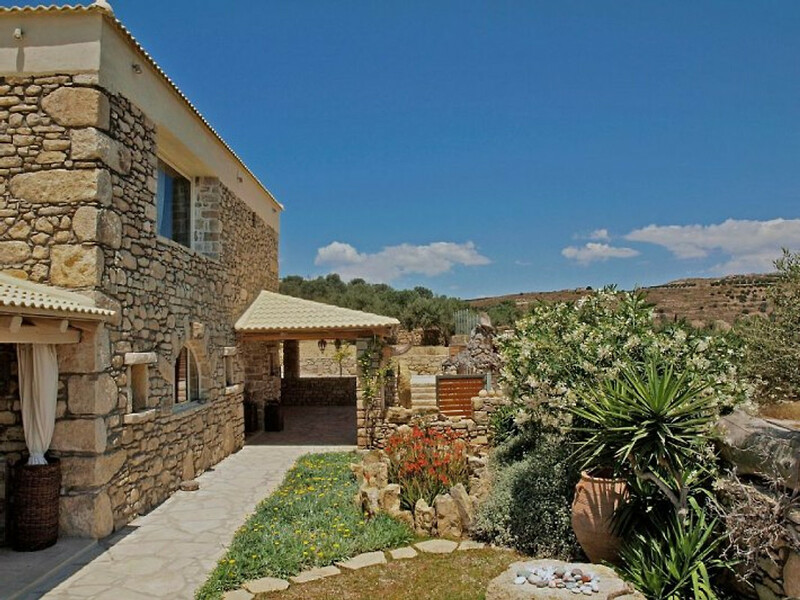 The breathtaking view of mountains and sea, its beautiful valleys, the intact nature conservation stand in sharp contrast to the cultivated coastal areas in the north of Crete. 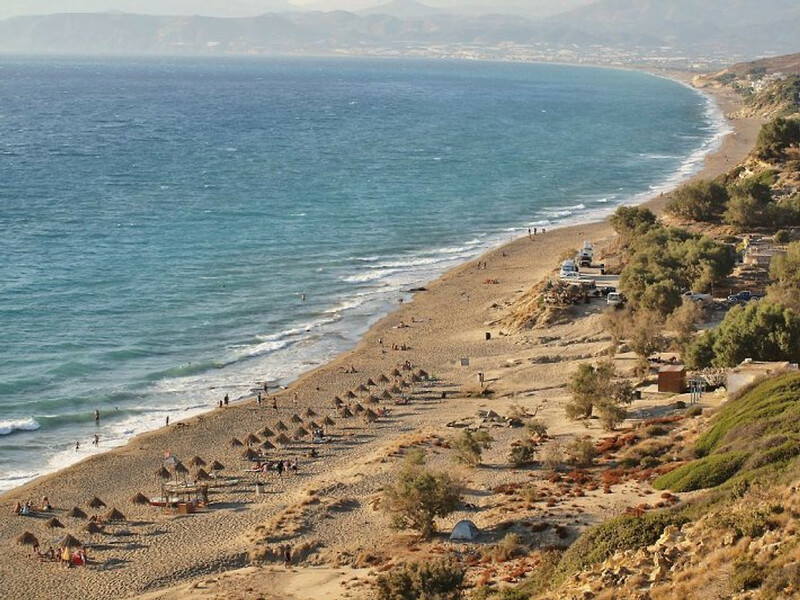 The most beautiful beaches of Crete can be reached in a few meters ( km). You can also go hiking or cycling or sightseeing in Phaistos, Gortina, Agia Triada, Matala, etc. You can also find taverns in the surrounding villages pitsidia, Sivas, Kalamaki, Kamilari where you can find traditional Cretan recipes and cooked meals with local products. You should definitely try wine and Tsipoudia (Raki). Shops, restaurants, live music and Greek dance are available within walking distance of the villa. The weather in the south of Crete is more sunny than anywhere else in Europe with higher water temperatures due to its proximity to North Africa and the Libyan. To put your everyday problems aside, recharge your batteries and recharge with sunshine so you can enjoy an unforgettable holiday. 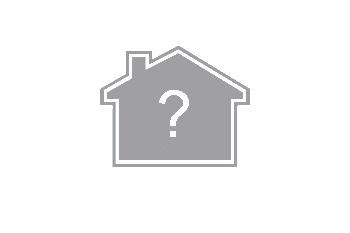 Check in: , Check out: 11: 00. Check-in and check-out may be modified in exceptional circumstances. Please do not hesitate to ask us what you need. The prices can be arranged according to the persons. You can also ask for our special offers the use of the heated pool is an additional 30euro charged for days. Ein wunderbares Haus, eine geschmackvolle Einrichtung, ein großer Garten mit Aussicht und ein beheizbarer Pool: was braucht man sonst noch für eine perfekte Ferienunterkunft? Eigentlich nur noch gute Gastgeber. Theodora und Manolis sind die Besten: liebenswürdig, hilfsbereit und ungemein großzügig. Wir danken euch für eure unglaubliche Gastfreundschaft! Ihr habt uns mehr als verwöhnt und einen unvergesslichen Urlaub bereitet. Danke für alles!!! Thank you so much for your review with all these nice words. We also enjoyed the time with you! 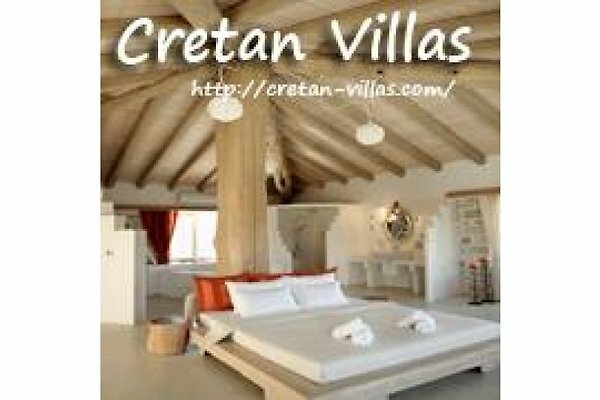 We hope we will see you again while visiting Crete in the future! Wish you all the best! Ein wunderschönes, weitläufiges Haus mit viel Liebe zum Detail dekoriert und eingerichtet; man hat einen tollen Ausblick auf die seichte Hügellandschaft, in die das Haus eingebettet ist; in der schönen Gartenanlage befindet sich ein beheizter Pool, was sich im April 2017 als großer Vorteil herausgestellt hat. Alles in allem ein kleines Paradies mit viel Privatheit! Theodora und Manolis sind ganz nette Vermieter mit einer überaus großen Gastfreundschaft! Ein durch und durch gelungener Aufenthalt! 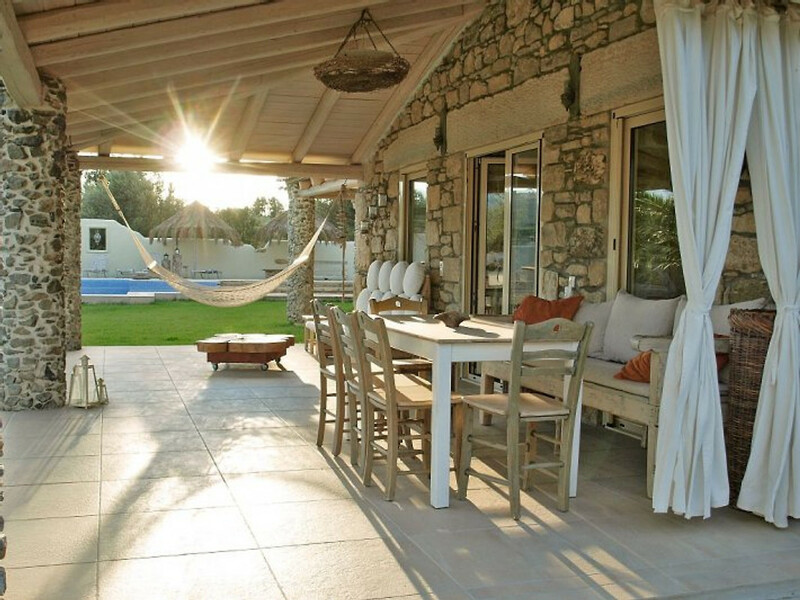 We highly recommend this villa! Thank you very much for your review and for all these nice words. We are happy that you enjoyed your holidays and of course our house. We hope we will see you again in the future. Wir waren als Familie mit vier Kindern in der Villa und es war sooooo unglaublich schön, dass am Ende keiner mehr nach Hause wollte. Aus unserer langjährigen Erfahrung mit Ferienhäusern, durften wir zum ersten Mal erleben, wenn Preis und Leistung wirklich übereinstimmen. Das eine ist das Haus, das andere sind die Verwalter! Was diese uns gegenüber erbracht haben ist einfach unbezahlbar!!! We had a wonderful stay at this villa. 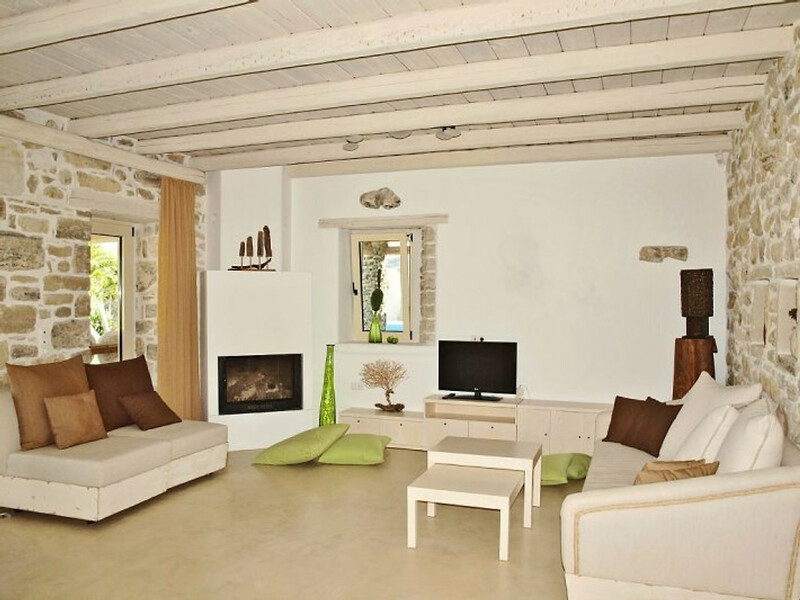 It is very modern and spacious and is equipped with everything that you could need. The master bedroom is spectacular but the other bedrooms are also very nice. 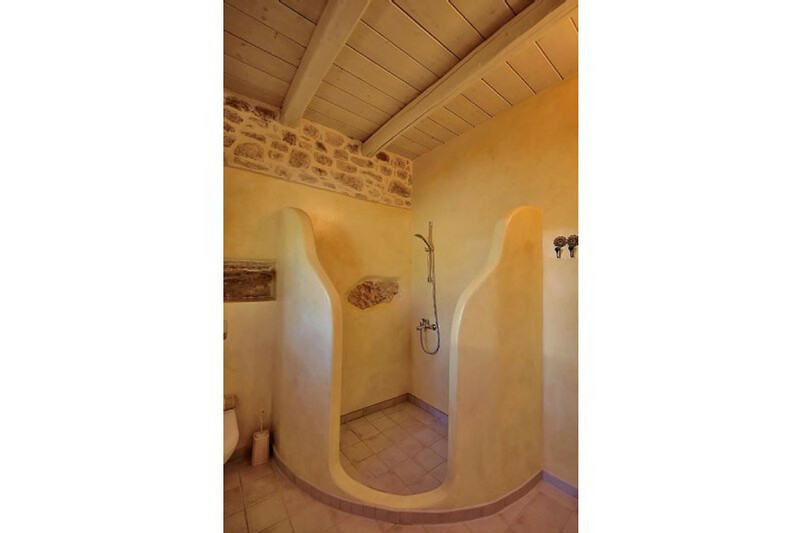 Three excellent bathrooms, and a convenient bathroom and shower outside too. The owners were very welcoming and made our stay so comfortable. They helped us to arrange car hire from a local company (including an airport transfer), they gave us excellent recommendations of local places to visit and very very generous: there were lovely cakes when we arrived, basic supplies in the fridge, beautiful strawberries, oranges for juicing... We highly recommend this villa!